Easter Sixlets. These pastel candy coated chocolate balls are the perfect Easter basket candy. 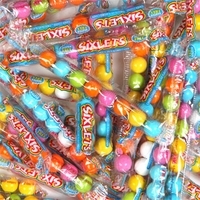 Each tubes has 8 candy sixlets. 28 packages of pastel sixlets per bag.